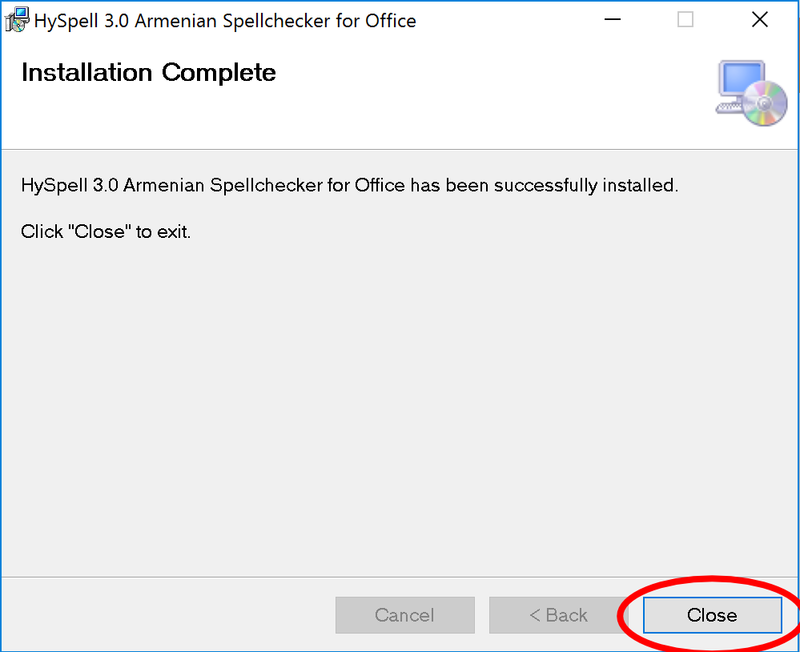 This guide will walk you through the process of installing HySpell Armenian Spellchecker for Microsoft Office. HySpell is a spellchecking plug-in (i.e. customization) that runs inside Microsoft Word and Outlook (PowerPoint and Excel are not currently supported). 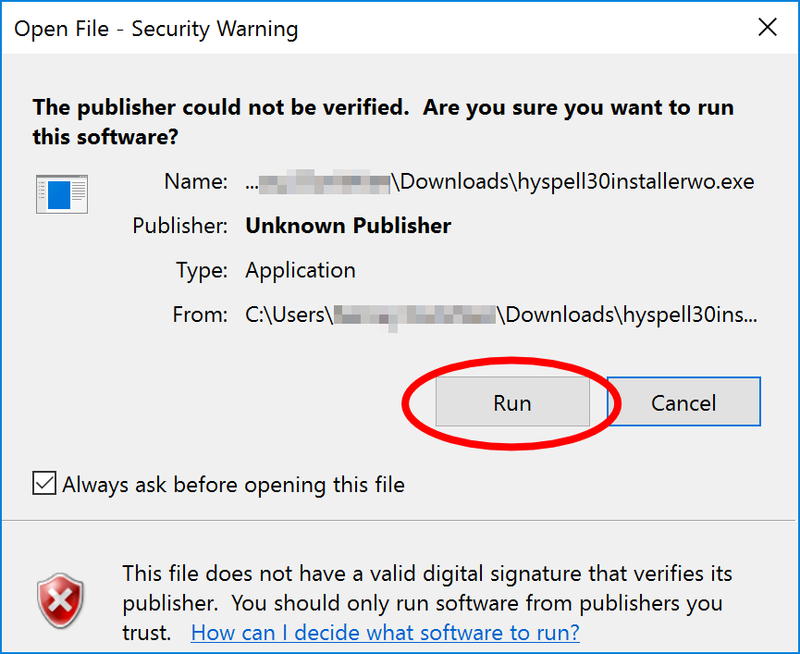 HySpell for Microsoft Office is supported on Microsoft Office versions 365, 2016, 2013, and 2010, running on Microsoft Windows versions 10, 8.1, 8, and 7. Make sure to have a genuine Microsoft Windows operating system license and a genuine Microsoft Office license; we recommend running the latest version of both. Before proceeding, run Windows Software Update. 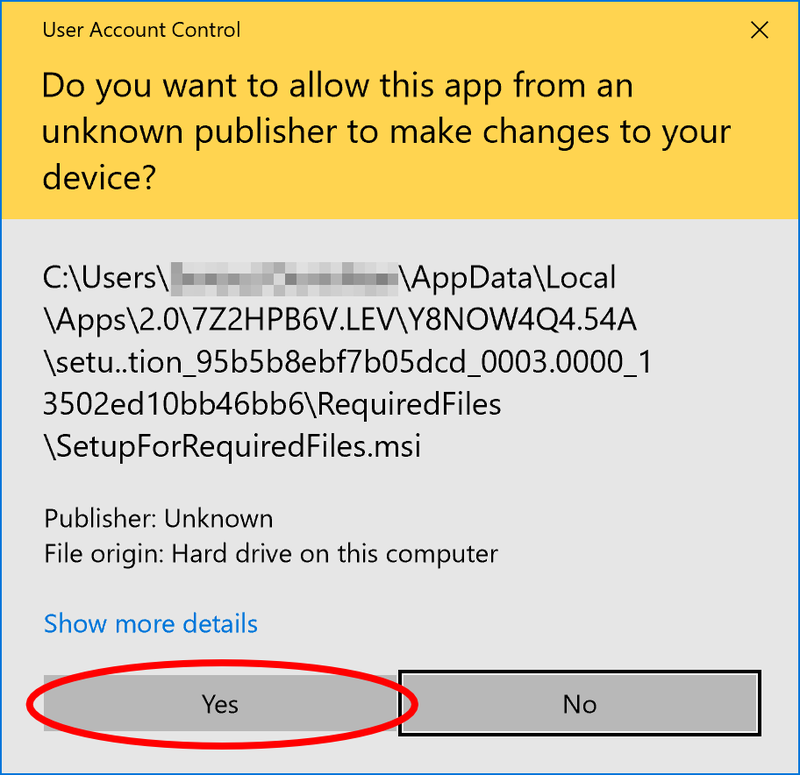 For Windows 10, see Microsoft's Update Windows 10 support page to learn how. For all other versions of Windows, see Microsoft's support page How to get an update through Windows Update. Locate the downloaded installation file and double-click on it. 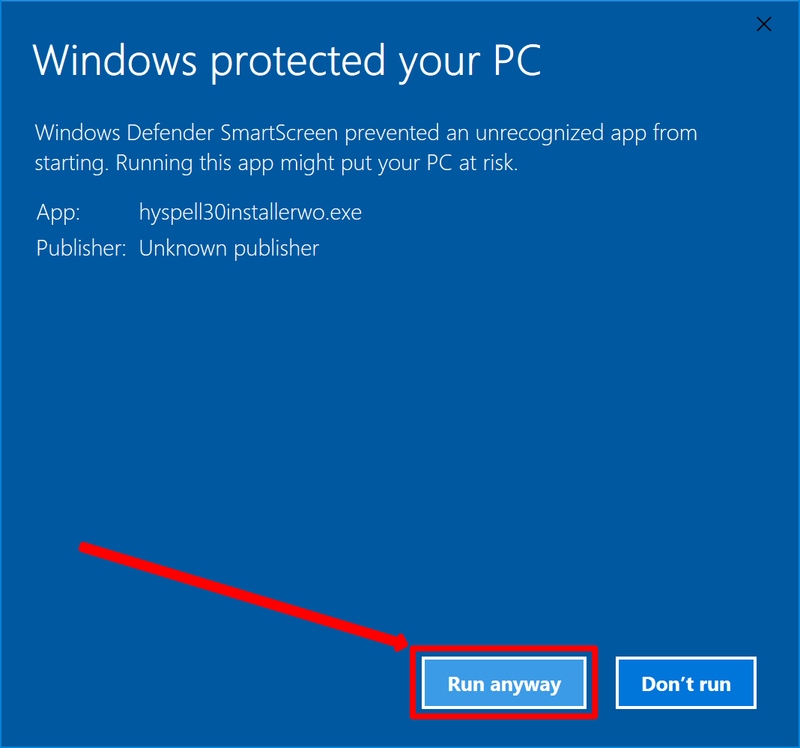 If Windows Defender prevented the installer to run, click on More Info and then click Run anyway. 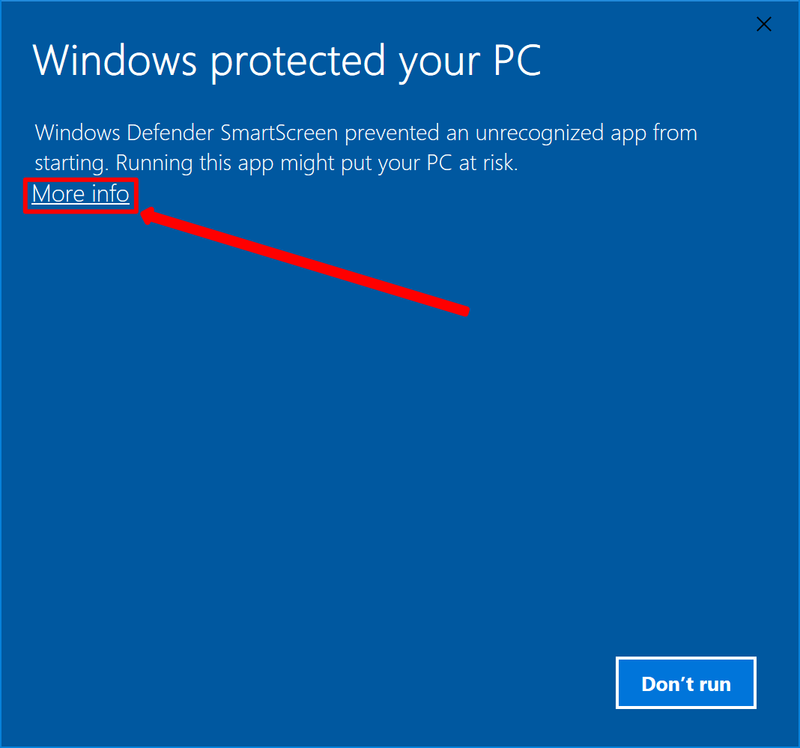 On older versions of Windows 10, you may see the following message instead. Confirm the security warning by clicking the Run button. Click the Install button to extract the installation files to the destination folder. Click the Install button to proceed with installation. The installation process consists of two steps: In the first step, the HySpell Required Files and Dictionaries are installed. In the second step, the Microsoft Office Customization Components are installed. Click Yes to confirm the security warning. The first step is complete and the HySpell Required Files and Dictionaries have been installed. Click Close. The Installer should now show that “STEP 1” has been installed (the Install button of “STEP 1” will be disabled and an INSTALLED label will be next to it). 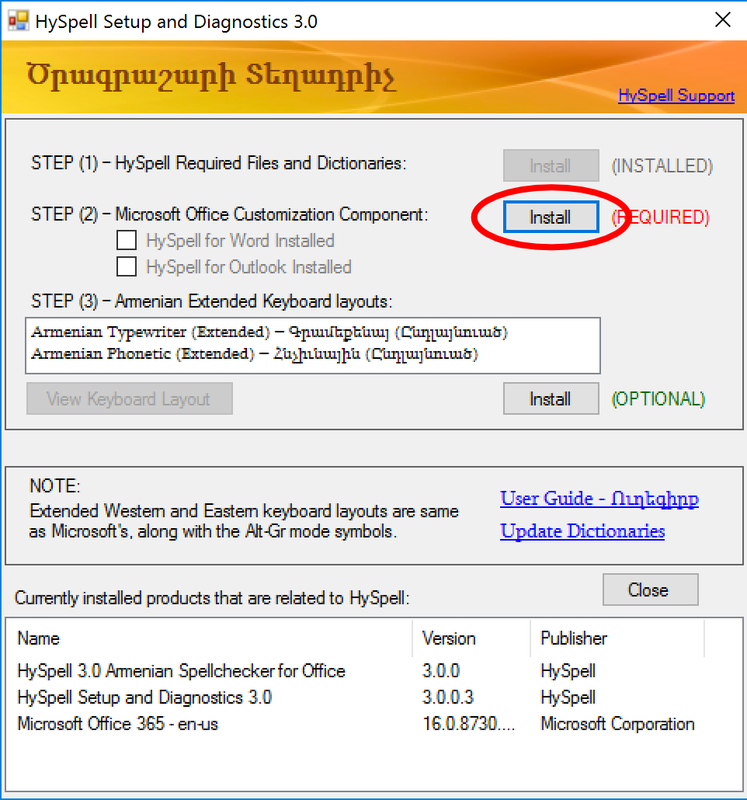 Now click the Install button of “STEP 2” to install the HySpell Microsoft Office Customization Components for Word and Outlook. The first time you install HySpell Microsoft Office Customization Components, you will be prompted to install the Microsoft .NET Framework and Microsoft Visual Studio Tools for Office Runtime. These are required components and the HySpell customization cannot run without them. If these components have already installed, the dialog boxes shown below will not appear, and you can proceed to Step 10. 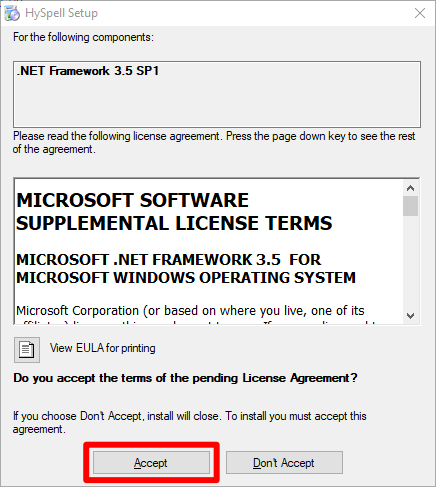 Accept the License Agreement to install the Microsoft .NET Framework by clicking the Accept button. 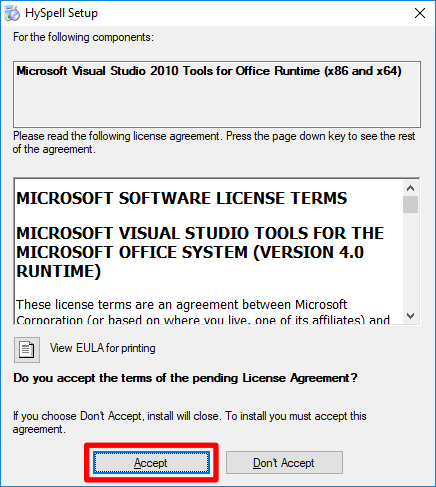 Accept the License Agreement to install the Microsoft Visual Studio Tools for Office Runtime by clicking the Accept button. 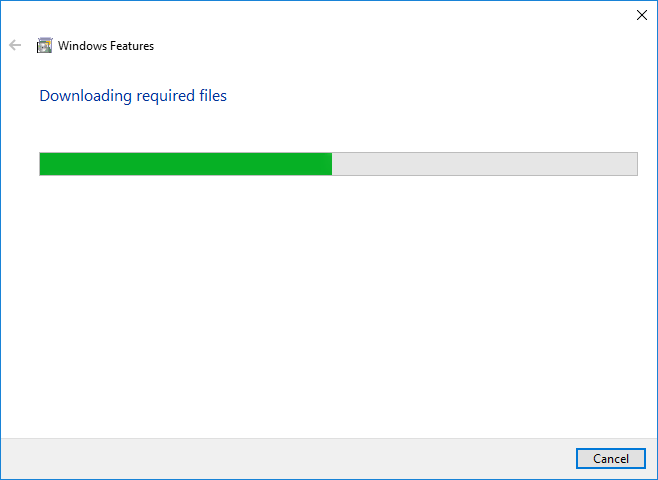 Wait while the Microsoft components are downloaded. 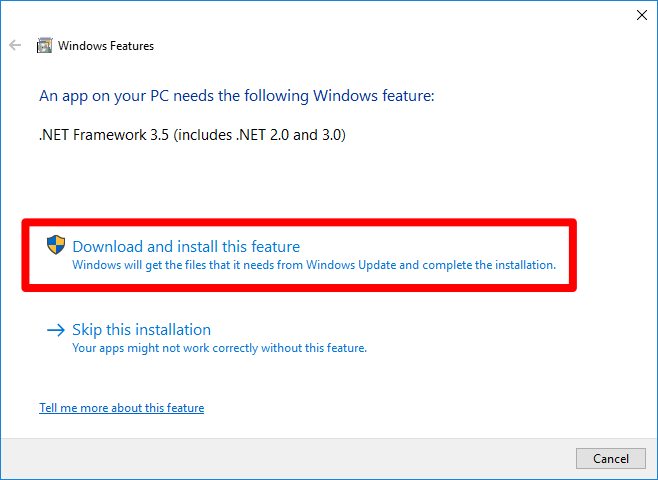 Click on Download and install this feature to install the Microsoft .NET Framework. Wait while the required files are downloaded. Wait while installation of Microsoft Visual Studio Tools for Office Runtime completes. Restart your computer after this step. 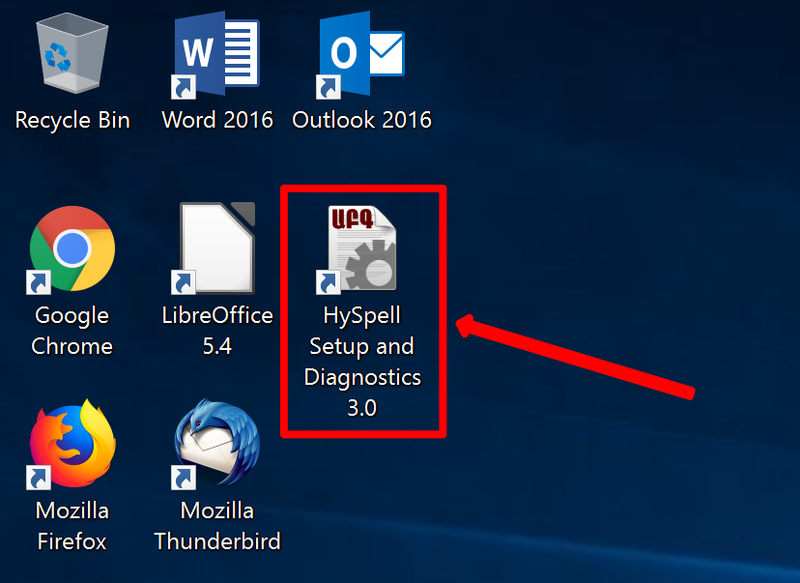 After your computer restarts, open the HySpell Setup and Diagnostics tool from the Desktop to continue installation. Now that the required Microsoft runtime (the Microsoft .NET Framework and the Microsoft Visual Studio Tools for Office Runtime) has been installed, click on the Install button again under “STEP 2”, in order to install the HySpell Microsoft Office Customization Components. The HySpell Customization Components for Microsoft Word and Microsoft Outlook will now be installed in two separate steps. 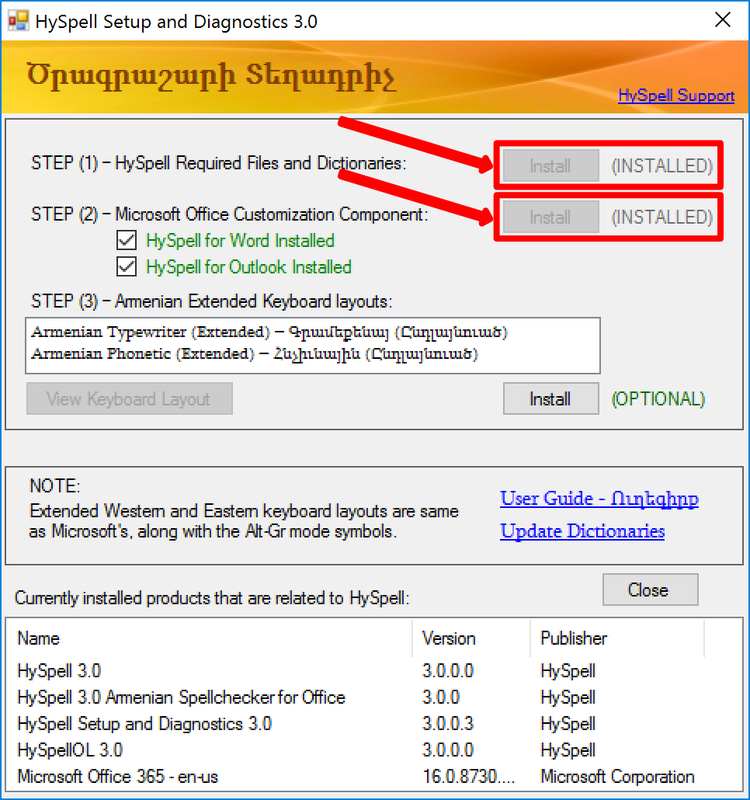 Click on Install to install the HySpell Customization Component for Microsoft Outlook. 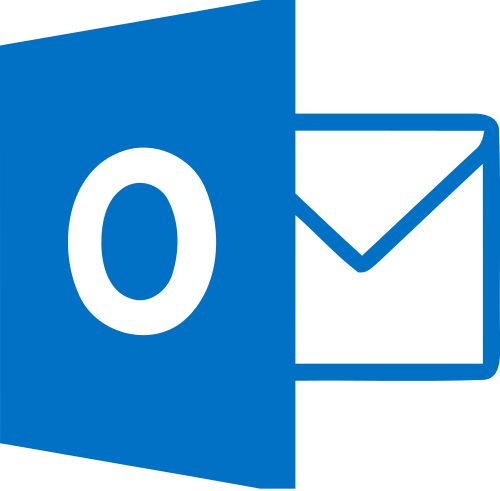 The HySpell Customization Component for Microsoft Outlook successfully installed. Click the Close button. 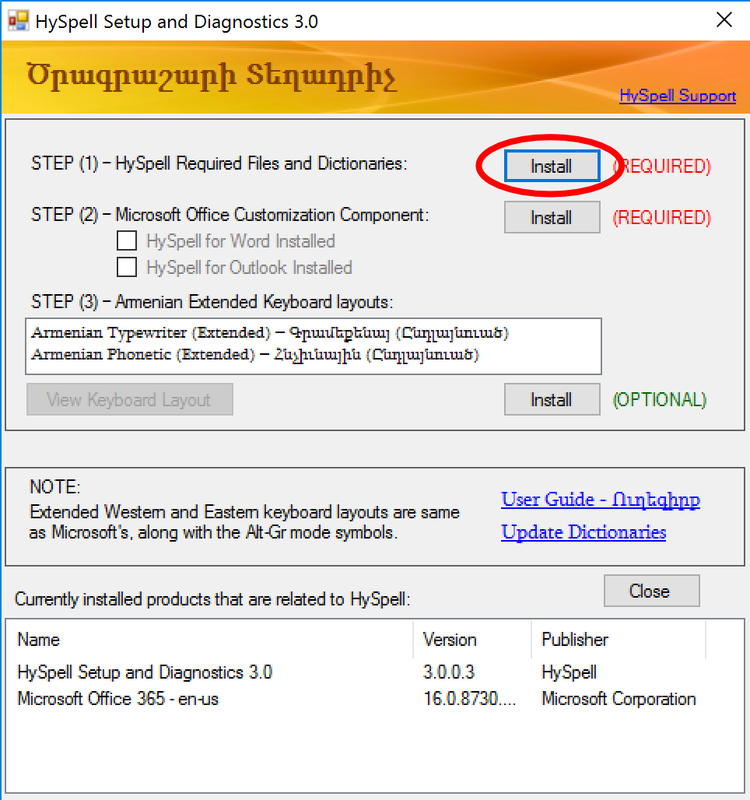 Click on Install to install the HySpell Customization Component for Microsoft Word. 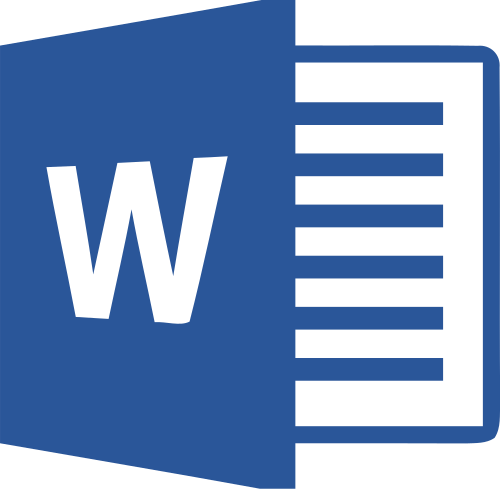 The HySpell Customization Component for Microsoft Word successfully installed. Click the Close button. 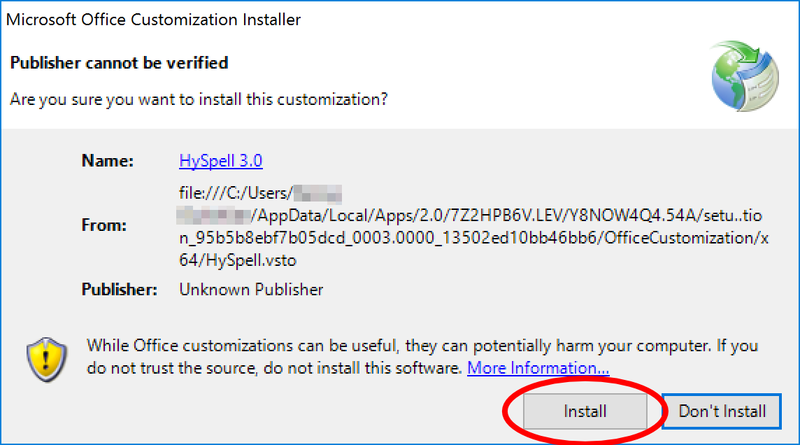 After a successful installation of HySpell, the Install buttons of both Step 1 and Step 2 will be disabled and an INSTALLED label will be found next to them (see below). 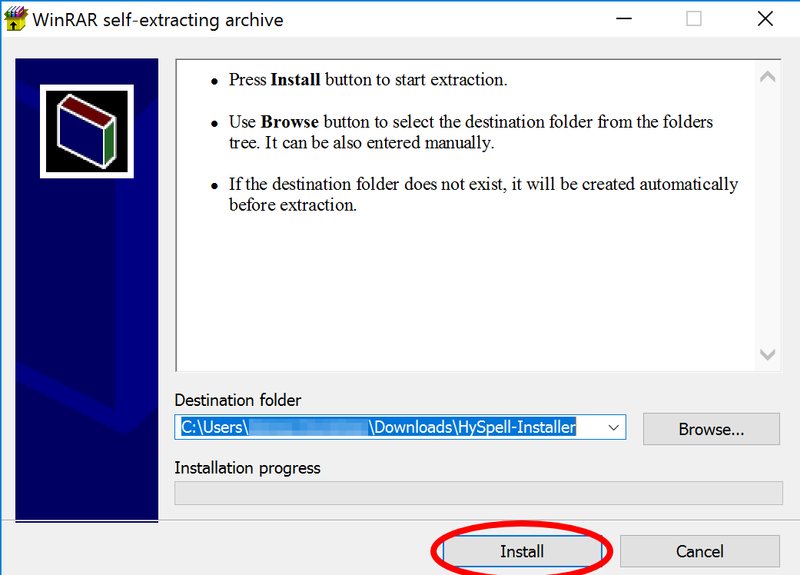 You can now exit the installer and start using HySpell from inside Microsoft Word and Microsoft Outlook (see the HySpell for Microsoft Word User Guide and the HySpell for Microsoft Outlook User Guide, respectively). 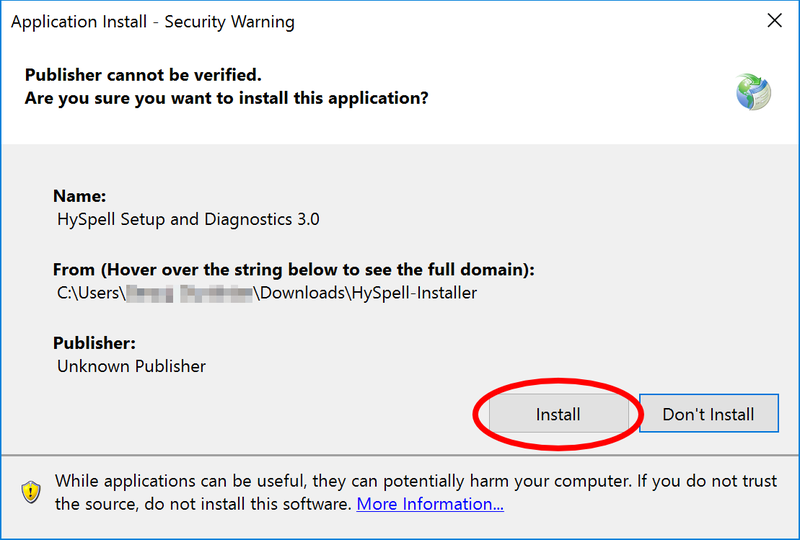 Should you need to uninstall HySpell for Microsoft Office, see the HySpell for Microsoft Office Uninstall Guide. For usage instructions, see the HySpell for Microsoft Word User Guide and the HySpell for Microsoft Outlook User Guide.